The photograph above is as about as far from Andreas Gursky’s careful constructions, described in the previous post, as it is possible to get. It is a close-up of a green algal floc Heather noticed whilst on a walk around a local nature reserve. I guess it fits the general description of “decisive moment” except that it takes a special sort of observer to find any interest at all in such an unprepossessing habitat. Under the microscope, the floc turned out to be composed of filaments of Spirogyra, with a single helical chloroplast. Members of this genus (and related genera such as Mougeotia) produce copious mucilage so are always slimy to the touch. 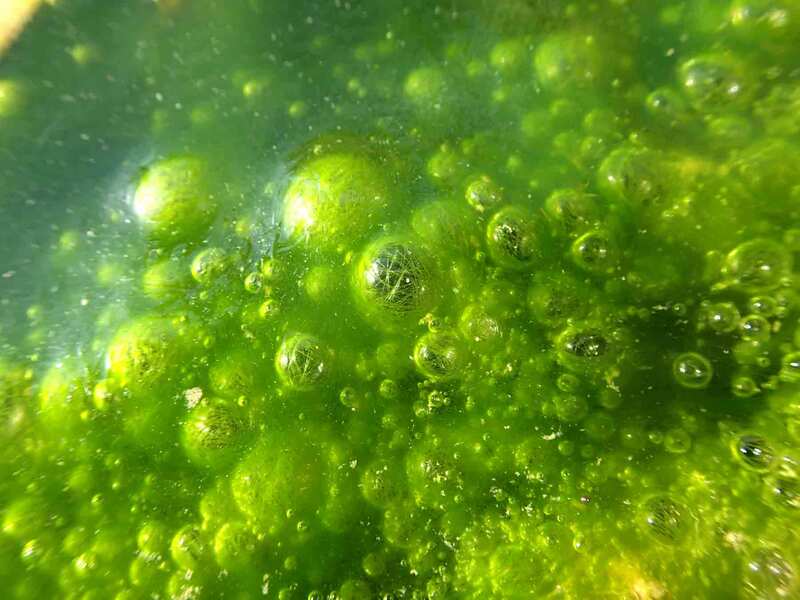 However, this mucilage makes it difficult for the waste gases produced by photosynthesis to diffuse away, leading to the production of bubbles within the mucilage mass. The interest, today, however, was that these air bubbles are acting as tiny lenses through which it is possible to make out the individual filaments of Spirogyra. 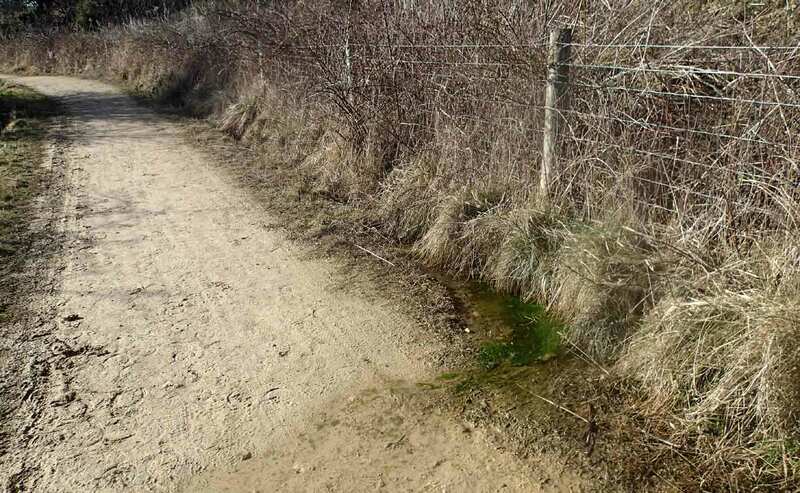 The green floc beside a footpath in Crowtrees local nature reserve from which the other images in this post were derived. I should add the caveat here that the photograph was taken with the “super macro” facility of our Olympus TG2 camera but the end-product is, nonetheless, impressive. It also offers us an insight into the world of the very earliest microscopists. Anton van Leuwenhoek’s microscopes consisted of a metal plate which held a tiny sphere of glass which acted as a convex-convex lens capable of up to 266x magnification to a resolution of little more than a micron (1/1000th of a millimetre) (follow this link for more details). To give an idea of what he might have seen with this, the right hand image below used 400x magnification. The algal floc at Crowtrees local nature reserve in close-up: left: an extreme macro view of a single bubble from the image at the top of the post and, right: filaments of Spirogyra photographed under the microscope. Scale bar: 20 micrometres (= 1/50th of a millimetre). This entry was posted in Uncategorized and tagged algae, Anton van Leuwenhoek, lenses, microscopes, Spirogyra. Bookmark the permalink. Spirogyra used to be the type example of a “plant” when I did biology at school decades ago for O & A -levels GCE: plastid containing chlorophyll (singular), thereby photosynthesising, and non-motile – proper plant features. I suppose this example was chosen as being easily examined under the microscope & commonly available. However, this genus is quite atypical of the Chlorophyta with its distinctive method of sexual reproduction by conjugation instead of using motile swarmers as in many green algae. A similar situation exists with the choice of Fucus as representative seaweed!